Step 12: Having had a spiritual awakening as a result of these steps, we tried to carry this message to the addict who still suffers. Next, I asked the group to think about the terms "spiritual awakening" and either draw or write about what that has looked like or if you haven't had a spiritual awakening yet, think about what you hope that spiritual awakening will look like. I experienced what I consider to be my spiritual awakening about 3 years into my recover. One night, I woke up from a dream that I was in a hurry to get to a female friend, to see her before she went away, possibly died. I was rushing and was nearly giving up hope of getting to see her when I finally arrived. I saw an old woman (apparently, the woman I was searching for). She was outside, squatting down, tending a garden. She looked up at me with a beautiful look of peace on her face. In that instant, I knew that she had been waiting for me, and for a long time, and that she would have waited no matter how long I took to get there. Although I never had a goddess image of my Higher Power prior to this dream, immediately upon awaking, I recognized that the old woman represented my Higher Power. I recalled when I first hit a bottom, at only 13 years of age. At that time, I had felt abandoned by God and felt very angry about having been abandoned. I gave up on the religion that I had been raised under up until that point. And I realized in this moment, waking up from this dream, that I was the one who had turned away from my Higher Power. My Higher Power had not been the one to abandon me after all. Afterwards, I realized that I had also abandoned myself. When I woke up, this realization felt so profound, I was moved to tears and sobbed for several minutes before going back to sleep. This dream would forever change my life, my recovery and my feelings about my Higher Power. 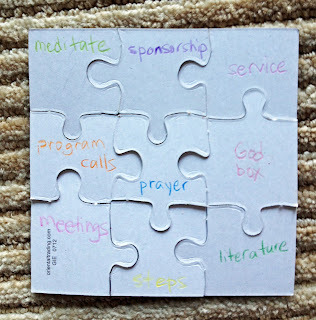 What will you put on your puzzle? I will be okay. God still loves me. Be curious. Ask for what I want and turn the outcome over to HP. Thank God for one thing that I'm grateful for today. Feel worthy from within. Other's behaviors and opinions are not my business. The struggle is the blessing. Over the years, the affirmations I needed to tell myself have changed according to my needs of the day, month, week or year. But I still find them to be an essential tool for my recovery. Thankful to my recovery, my life has become more abundant and I have moved into a new, nicer home. I've been resistant to taping pieces of copy paper onto my walls. In preparing for my wedding (another gift of working my program), I saw these little chalkboards people were making to use as signage at their weddings. Although I didn't do this for my wedding, it occurred to me that they would be perfect for my affirmations! 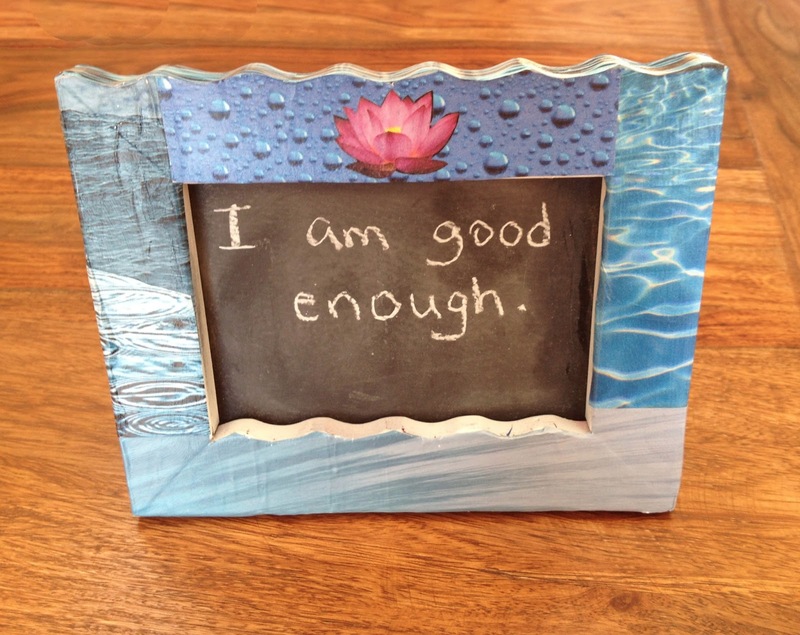 I have multiple chalkboards in different rooms of my home and can change the affirmations whenever I want. And they just look like home decor. That quote is not mine. And I'm afraid I do not know the author. But I have been sick lately, so that is the message I've been needing to hear. It's reminded me I can do phone meetings, even if I am too sick to get to a live meeting. For the art project for my meeting, I decided to turn this into a group project. 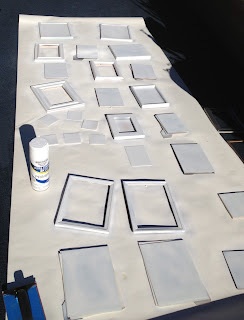 I prepared the chalkboards in advance and had the project focused on decoupage for the frames. But the actual conversion of a standard picture frame into a chalkboard could have been the art project, too. 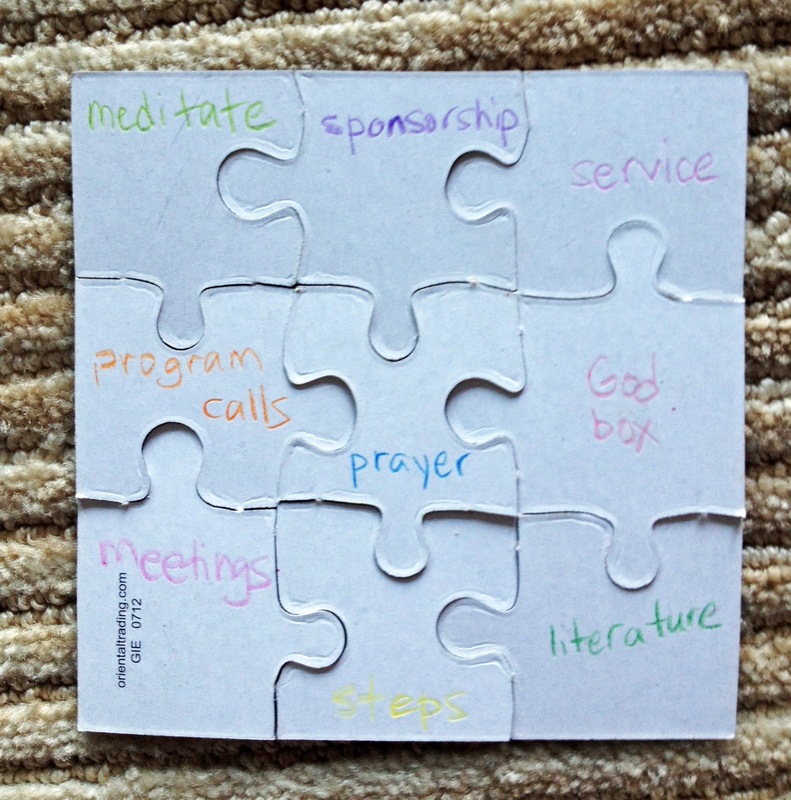 But I wanted to focus on the affirmation aspect of the project. I will describe both processes, but you can choose to do one or the other or both. 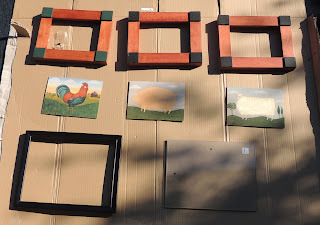 picture frames: I just picked up a bunch from thrift stores and gathered some from around my home that I wasn't using, to keep the cost low. As photos become more and more electronic and less and less physical, frames seem to be showing up more and more in thrift stores. Any frame will suffice, so long as it has glass or a wooden surface to convert into a chalkboard. primer paint (I used a spray primer, but you can use canned primer, as well). 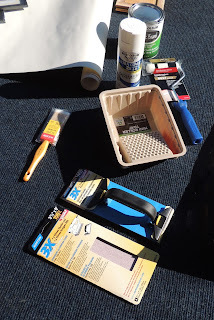 protection for surface you'll be painting on: I used a roll of heavy paper I picked up at a thrift store and a large box that I broke down into a large surface. A disposable tablecloth would also work. 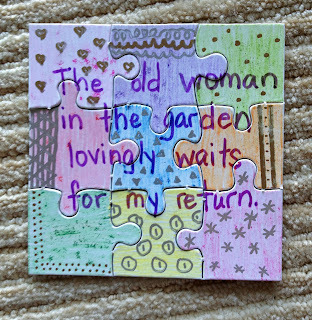 Mod Podge to cover the images with when you are done. 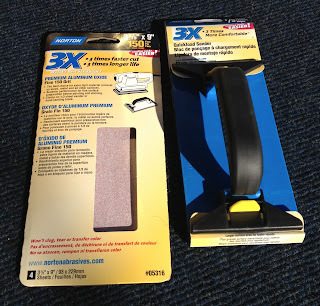 This will hold the images in place, prevent them from peeling off and harden them into a sturdier surface. 1. Find a space to work and lay down your protective surface. 2. Wash the picture frames, especially if they are used. I just used Lysol wipes. You simply want to get off any debris that would get caught in the paint. 2. Separate the glass from the frames. As you can see in the photo, the bottom frame was glass, but the top frames actually contained some artwork that I was willing to sacrifice to the cause. Since they were painted on wood, that surface worked well for the chalkboards. 3. 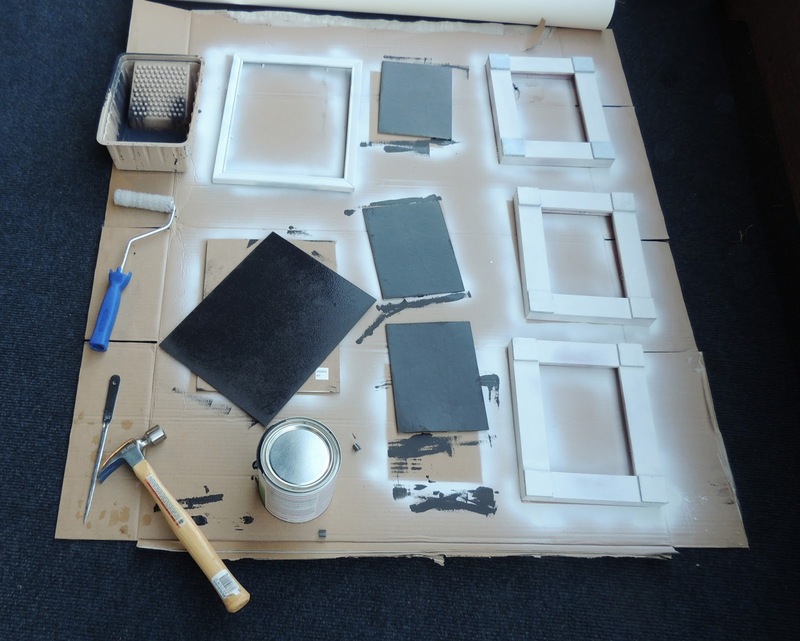 IF you are planning to decoupage the frames, you may want to sand any of the frames that are painted in a gloss paint to help the primer and decoupage adhere to the frame. If you are satisfied with the appearance of the frame and don't plan to decoupage it, then you can skip this step. 4. 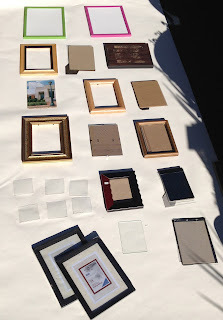 Before painting, be sure your pieces are all laid out on the protective surface with room between them to get to the sides of the frames and to avoid spraying on any nearby surfaces you don't want painted. If you are using spray primer, as I did, add more room than you think you need. I ended up spraying our patio carpet. So again, add even more room than you think you will need. The spray paint went beyond the paper you see in the photo below, so use MORE space than this. 5. Read the instructions on the paints you purchased. 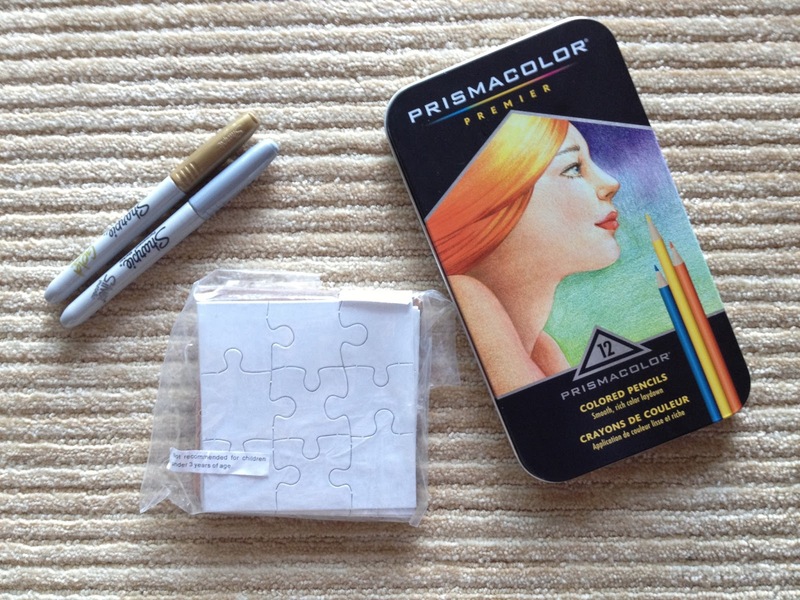 My paints may be different from yours, so follow the instructions on your specific paint supplies. 6. Primer: If you are not decoupaging your frames, you can simply apply the primer to the glass or area you will be applying the chalkboard paint. But if you plan to decoupage your frames, you will want to apply primer to the frames as well. 7. Apply chalkboard paint. Do NOT apply to frames; only apply to surface you want to be able to use as a chalkboard. Again, follow the instructions on your paint can. 8. Allow to dry (again per your paint can's instructions). My chalkboard paint had to dry for 4 days before the chalkboard surface could be used. So be sure to allow time for this before presenting your project to a group or as a gift. OPTIONAL: Separate chalkboard from frame again. We skipped this step and just did our best to avoid getting glue on the chalkboard surface. Using a paint brush, apply Mod Podge to entire surface, again, avoid getting it on the chalkboard. It will look white, but don't worry. Mod Podge dries clear. Allow to dry. 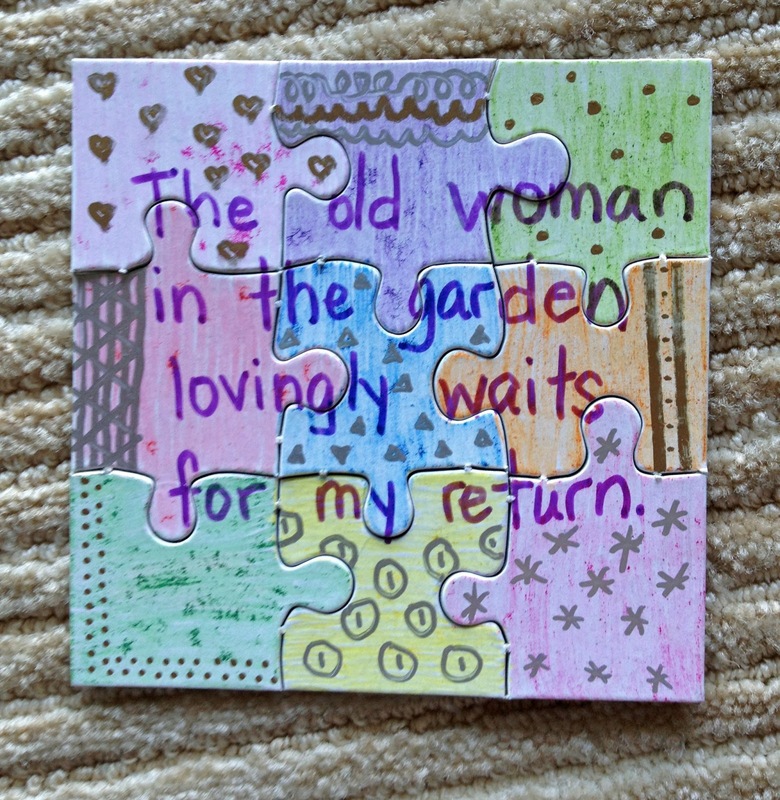 Mod Podge should dry in approximately 15 minutes. 10. Prep your chalkboard surface before writing on it. Read the instructions on your paint as to how to condition the surface. For my paint, I was instructed to run the chalk length-wise over the entire chalkboard and erase, leaving a layer of chalk dust on the board. Then I could write on the board. If I wrote on the chalkboard without conditioning it first, I was informed the words may not erase completely.